Welcome back, followers and lovely colleagues! She is sitting next to me and already sipping her coffee. Hi, Cate! Are you ready to answer the second batch of questions about your true colours? In case you missed the first part of the interview with this lovely brunette, you can find it here. ▷ I would love to learn a Scandinavian language, as they are said to be quite similar to Dutch and German (which I already speak) and Nordic languages fascinate me. ▷ Don’t pull all your eggs in one basket. ▷ Just found this in the internet and made it to my favourite saying: “Don’t Worry About Those Who Talk Behind Your Back, They’re Behind You For A Reason”. I can relate to it!!! ▷ Don’t let others convince you that you’re not going to make it. ▷ Greek καθαρος (katharos) “pure“. ▷ Rock/pop. Many different bands /artists. I get bored if I listen to the same one too long. ▷ I’ve always avoided concerts because I’m afraid of crowded places. But I quite enjoy the Belgian music festivals. A few days ago I attended the Night of The Proms in Antwerp, featuring stars like John Miles, The Pretty Vanillas en John Miles, just to name a few. I really enjoyed it. ▷ Wind of Change by Scorpions. ▷ Clive Owen, Emily Blunt. ▷ Yes, The Phantom of The Opera. ▷ My mentor, a seasoned conference interpreter and translator called Ina. ▷ “Cultivate your creativity”. I think I was way more creative as a teenager than I am now. ▷ No, way too painful I guess. ▷ Exactly in the place where I live now. ▷ Ken Follett (British writer). ▷ Ask him to write a book about our contemporary history, about our generation, about what is going on in different parts of the world right now, taking different perspectives. I could offer to arrange the translation into different languages. What an amazing time we spent, Caterina! Your lively personality is really attractive. I’ve felt a great energy coming from you. You are determined, yet very cute. I think your name perfectly reflects your soul: you are pure. I already thought you were a positive, bright soul when we met in Bordeaux, but through your words you have confirmed that first impression. I hope that you could meet Ken – stalk him! Social media can do the trick! *just joking… or not? * and I’m sure you will achieve a lot in your life, because you know who you are and what you can do. I’m impressed, keep going, dear! It has been a pleasure to have you as my guest. Thank you so much for saving some time to visit the coffeece! Who’s Caterina? 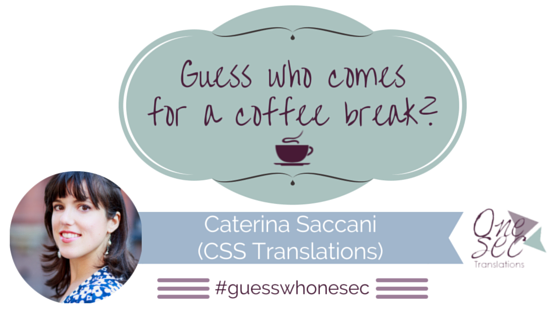 ▷ Caterina (of CSS Translations) is an Italian conference interpreter and translator based in Aachen, Germany. Born and raised in Correggio (Northern Italy), she gained a BA degree in translation and interpreting from Bologna University (Forlì) in 2011 and a MA degree in Conference Interpeting from Mainz University (Germersheim) in 2014. Currently she works as a full-time freelance conference interpreter and translator specializing in corporate communication, marketing and law. She is active on many social media platforms (including Twitter and Facebook) and loves meeting other great #xl8ors at conferences and networking events.